"We sometimes overly associate the power of the priesthood with men in the Church. 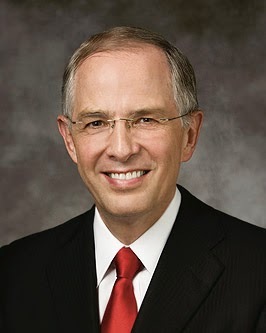 The priesthood is the power and authority of God given for the salvation and blessing of all—men, women, and children. "A man may open the drapes so the warm sunlight comes into the room, but the man does not own the sun or the light or the warmth it brings. The blessings of the priesthood are infinitely greater than the one who is asked to administer the gift. "To receive the blessings, power, and promises of the priesthood in this life and the next is one of the great opportunities and responsibilities of mortality. As we are worthy, the ordinances of the priesthood enrich our lives on earth and prepare us for the magnificent promises of the world ahead. The Lord said, 'In the ordinances ... the power of godliness is manifest' (D&C 84:20). "All of the ordinances invite us to increase our faith in Jesus Christ and to make and keep covenants with God. 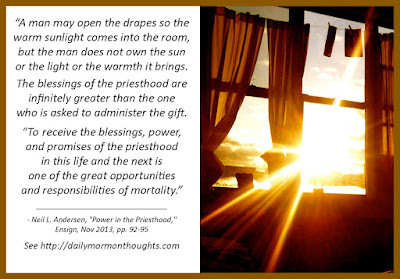 As we keep these sacred covenants, we receive priesthood power and blessings." It is up to each individual, man or woman, to receive the power and blessings of the priesthood in his or her individual life. We do that through receiving ordinances, keeping covenants, and growing in faith in Jesus Christ.